Premium olive oil production is now a significant industry in Napa County. Napa is second only to Sonoma County in the number of olive growers in California. See the links below for information on olive culture and olive oil production. 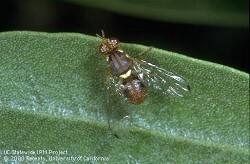 Olive Fruit Fly is a new pest that is a major concern throughout California. Click on Olive Fruit Fly (small box on the left) for more information. Paul Vossen : Farm Advisor, UC Cooperative Extension, Sonoma County: Paul has a number of useful publications on this site including "First Press", a newsletter of olive oil production and evaluation.